KitMonsters – Moog Rogue. The music makers’ guide to making music. The Moog Rogue is a monophonic analog synthesizer produced by the original Moog Music in the early 1980s, but, was not designed by Bob Moog. Very basic in its design and use, the Rogue featured a 32-note keyboard and two VCOs. VCO number 2 is tunable between a half-step below to an octave above VCO number 1. This allows the Rogue to play atonal sounds like the Moog Prodigy. The Rogue did not have features to allow the user full flexibility to program the patch settings, however the VCF and the VCA were simple in operation. The design of the hardwired patch system was well thought out (considering its size and cost) and a wide variety of sounds and modulation effects are possible. The Rogue also includes a Sample-and-Hold feature that the Prodigy does not. The synthesizer is most commonly used for its powerful bass. The Rogue is similar in some respects to the famous ARP Odyssey, though smaller and slightly less versatile. 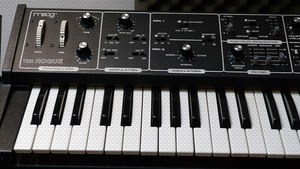 Moog Music was criticized for repackaging the Rogue as the Taurus II, changing the design to a pedal-operated synthesizer with little difference in sound quality. The Rogue is very similar in design and sound to the less-expensive Moog Concertmate MG-1, also made by Moog Music, but rebranded for Realistic around the same time for home use. This was perhaps the first example of a keyboard designed for the home musician.